A cab leaves a designated taxi stand in Ho Chi Minh City in this still image taken from a video by Tuoi Tre. Five designated taxi stands were officially inaugurated in Ho Chi Minh City’s central business district on Wednesday, in a bid to tackle traffic congestion. Passengers are supposed to come to these taxi stands when they want to hail a cab, instead of doing so wherever they want. 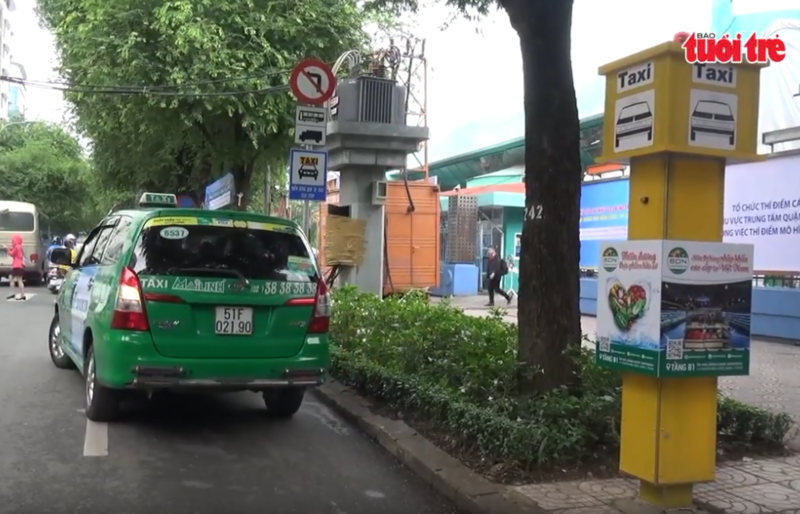 The new taxi zones are located in front of the Nhi Dong 2 Hospital and Galaxy Cinema on Nguyen Du Street, and at 29 Ly Tu Trong, 2 Han Thuyen and 16 Alexandre De Rhodes in District 1. Each stand includes a yellow column, a waiting area on the sidewalk, as well as yellow stripes marking stopping spots for the vehicles. A cab will have around two minutes to either drop off or pick up customers there. Passengers only need to press the button on the yellow column to hail a taxi. According to the District 1 administration, the problem of taxis stopping to drop off and pick up passengers at any place has seriously worsened traffic congestion in the downtown area. The designated taxi stands are installed as part of a six-month pilot scheme, which will be expanded to other areas if the trial proves successful. District 1 chairman Tran The Thuan said authorities welcome all feedback from the public to improve the quality of the taxi stands, adding they are considering installing roofs to shield waiting customers from rain and the sun. There are currently around 12,500 taxis and 5,000 Grab cars in Ho Chi Minh City, according to news website VnExpress. Commenting on the designated taxi stands, many cab drivers said the facilities will make it easier for them to reach customers, and will save them time usually spent driving aimlessly around the city. Customers also believe it is a positive change so that they will not have to spend time looking for taxis anymore. However, on the first day, few passengers were spotted at the taxi stands, according to observation by news site CafeF.